* Planetary gear set failure in the AXOD and AXOD-E transmissions. * Inadequate lube flow to front and rear planetary. * Extreme heat buildup in planetary core. 1. The Superior Lube Dam helps to eliminate front and rear planetary failure. 2. 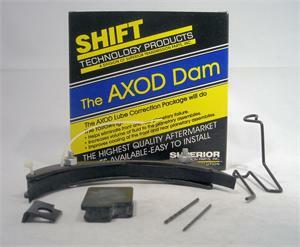 The AXOD Lube Dam increases the volume of fluid to the planetary assemblies, thus giving proper heat exchange by flooding the front and rear assemblies. 3. The planetary pinions and needle bearings run in an oil bath, ensuring total lubrication. Since the amount of lubrication is increased dramatically, better cooling is assured. 4. The Lube Dam offers easy, time saving installation. 5. 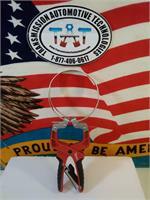 This patented Superior product has been featured at ATSG seminars and in the ATSG technical manual.